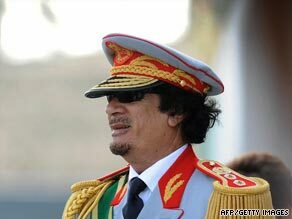 Libyan leader Moammar Gadhafi greets guests at a military parade in Tripoli earlier this month. The mystery appears to be solved. From the air and on the ground, New York media were in hot pursuit today of Libyan leader Moammar Gadhafi's tent. He's in town for the United Nations General Assembly. But, where did he put up his tent? The answer may surprise you. The tent is in Westchester County, New York just north of the city on property owned by the Trump Organization. Yes, as in Donald Trump. The organization said in statement: "We have business partners and associates all over the world. The property was leased on a short-term basis to Middle Eastern partners, who may or may not have a relationship to Mr. Gadhafi. We are looking into the matter." A lot of people are not happy with Colonel Gadhafi's tent location. "There is no legal way to prevent this, as he is a head of state, despite the fact that he has a long history as a terrorist," County Executive Andy Spano said in a statement. "However, from my point of view, he is not welcome in Westchester." There are reports his request to pitch his tent in Central Park was denied. And, last month you may recall there was speculation that Gadhafi would put up his tent in Englewood, New Jersey, on the lawn of a home owned by the Libyan government. The residents of the predominately Orthodox Jewish community didn't want a visit from a leader who has made anti-Zionist statements in the past. It's also where dozens of victims of the Pam Am 103 bombing lived. Two suspects charged in the attack were Libyan citizens. One was never convicted. The other was recently released heightening the bitterness toward Gadhafi. Tonight we'll have the latest developments on the Gadhafi controversy. And, find out why Gadhafi likes to set up tents when he travels. He's done it in France, Italy, Russia and many other places. Would you be upset if Gadhafi pitched his tent in your town? Sound off below. Join us for this story and much more starting at 10pm ET. Under no circumstances should this ogre be allowed to dwell any where on this planet, except in his own nomadic environment, among his peers. He should not have a visa fo enter this country, he is a terrorist. If you don't take care of your house who will?? Throw this guy in presion.... he is very bloody and bad guy. Allowing Qadhafi to pitch a tent the U.S.A is like slapping and spitting in the face of our Soldier's and the families that lost loved ones in Lockerbie bombing. Releasing the Lockerbie bomber, a known ill terrorist was a enough to ruffle feathers; however, a visit from Qadhafi is a crime. What is The Donald thinking? Oh, yeah, money, money, money... GREED. This is an insult! Who is next to pitch a tent on American soil? Osama Bin Laden? Apparently, Americans put more worth on the dollar than morals and ethics. What a truly disturbing site to see. i flew for panam world airways.it is a sad day for everone in the airlines...the man should be banned. obviously we all know, or should know that Trump doesn't care what we the people think. Bottom line, there's gotta be something in it for him. We just don't know what it is -yet! I am angered that Gadahfi would be allowed to come to our soil. Whats next ? Bin Lauden pitches a tent on the lawn as well, maybe he's reformed to along with Sadahm Husain. This along with many other choices Obahma has made for this country shows quite clearly we the people should be concerned. If I may be so bold as to correct you Obahma this is not your country, your America this is OUR country. How can we allow a known terrorist like Gadhafi to enter our country? My brother was on the navy carrier that bombed his compound in the 1980s and I feel by allowing Gadhafi to so much as step a toe in US soil is just a "spit in the face" of all the men and women who served on that mission. What does this action say to other terrorists?? I support President Obama, but he must know that Americans are demanding intervention. Kadhafi, Gadhafi, Qadhafi or whatever he is calling himself these days is a terrorist pure & simple. He should not be allowed on American soil or American territories, unless of course, he is to be arrresteted for the Lockerbie murders and immediately imprisoned. We have him here now, why let him go free? that's just perfect......we got american soldiers fighting and dying in the middle east, and what do we do to show our support? by inviting a known terrorist supporter like Ghadafi, not only to come to America, but to add insult to injury, to have one of the world's best known industrialists let him stay on his property. What's next? We finally catch Osama Bin Laden and invite him to explain his actions at Disneyland? C'mon man! Donald Trump, what was going through your mind.....or hairpiece? Really? What next.. Have Osama over for tea and biscuits? I think he needs to pack up his tent and go back to where he came from. Mr. Donald Trump needs to march over there to his estate and physically remove the tyrant. I think its a pure act of ignorance, that our own men would step up and offer a plate to one of our country's worst enemy. He has no room in the US and shame on Donald Tramp. It is beyond reprehensible to know that a KNOWN TERRORIST has been allowed into our country, much less that Trump would enable him. Trump is unarguably a brilliant business man. However, Trump is CLEARLY making a stance AGAINST the USA. THIS IS TREASON, IN THE MOST BLATANT MANOR~!!!!!!!!!!!!!!!! You should interview a young men like myself and I'll tell you how bad we are making it, in simple terms. Our values have fell off the roof for which we will see worst if we doing make a huge stand! For what is rite! This is not something I usually do, but I was so appalled to hear that this country is allowing Gadaffi into this county, much less stay in NY. This man and his regime have a long history of terrorism. Many people were killed and robbed when Gadaffi backed a coupe in Ghana W. Africa in the 80's, not to mention the horrors of Lockerbee. This country has spent millions of tax payer dollars fighting terrorism, not to mention the horrible loss of lives of our brave military personnel. How can be allow this man into our country. It is shameful. I think its a pure act of ignorance, that our own men would step up and offer a plate to one of our country's worst enemy. He has no room in the US and shame on Tramp. Absolutely not. I can't believe Donald Thrump is welcoming him even after his outrageous home welcoming of the released terrorist. Am in the military and this is an insult for all I and my fellow soldiers have been fighting for. Gadhafi should not be allowed to operate the way he wants to on our soil. He needs to be contained, confined and monitored. He's been a terrorist and a bully. We can't allow terrorists and people with blood on their hands to come into our country and operate the way the want, especially given that he has directly effected the lives of American citizens. Get him on the campus of the UN and make him stay until the General Assembly is over!! Mr Gadaffi is welcome at my house anytime, I'll provide space for the tent if he insists. His tent wasn't there, then it is there, then soon it will be gone. Who cares, really? Though I do wonder if he sleeps in his uniform. Tpoput it bluntly, Libya was taken off the Terrorist list in May, 2006. Don't blame Obama, blame Bush!! This ia a blow to our country and our consience Trump what are you thinking??? Obama what are you thinking and who are you really?? What are you all complaining about? He's the President of Libya and yes they once were a terrorist nation, but not anymore ... NOOOO not according to the Obama Administration, but the BUSH administration, as of May 2006 ... it's amazing no one has yet made that point. Gadhafi can pitch his tent in my front yard in Calgary Alberta Canada – in January. Libyan leader Moammar Gadhafi's visit to the US is hurtful and cruel to the family's of his victims. Trump's approval and 'hospitality' to the terrorist is a slap in the face to every American. Trump chooses his friends and politics based on what will get him the most media coverage, from homophobic and judgemental beauty queens to, now, a terrorist. Trump may try to play the "I didn't know" card, but he knew. What next – a slumber party at Mara Lago for Osama. Perhaps the spray from his orange-tan or hair shellac is getting to him. NY don't allow this travesty to occur in any community. Stand together and send Gadhafi back to where he belongs. Moderation??? ?is America moderate welcoming a murderer within our borders????? Please stop this giving violent nut bar publicity. Please let's get the "human" out of our country and not talk about him so much any more. The blood of our sons and daughters fighting over the years to give Donald Trump the freedom to amass his fortunes is desicrated by his lying loyalty to this foreign lover of terrorists. Donald Trump should be ashamed. President Obama should be ashamed and probably impeached for even allowing a killer and a homicidal maniac like Kadahi to even be allowed on American soil let alone to set up a tent on either personal or public property. To think that such a thing would be allowed openly after his open involvement in countless acts of terrorism is against all principals and values upon which our country has been established. I am aware that in the past such underhanded dealings have gone on behind closed doors by both big business and governmental parties. To allow such an effront out in the open is a clear slap in the face of the American people who have shed blood in order to keep such fiends off of our shores. Now it seems that we are to welcome them but we don't Mr President and Mr. Trump. what ever happen to to forgive seventy times seven ? It seems to me that christ will meet all of those unforgivers in their old ways while Gadaffi will go to heven. If you guys believe that Gadaffi should not be here. then George Bush and many other us leaders should not be allowed on others people soil as well . Do you remember the ppeople of El salvador. and the many other people that was killed by the hands of the US in the name of peace . Qadhafi should not be welcome here. Look at the many lives that was lost when planted a bomb and blew up an airline. This will be a slap in the face to our country if he stays here. Yes, protest and send a message that we don't want him here. it is the country of the free, he is free to put his tent in a house that he rented.